Although Cooler Master is mainly known for their computer cases and cooling products, by now most of us are aware of their growing gaming oriented line under the CM Storm brand. 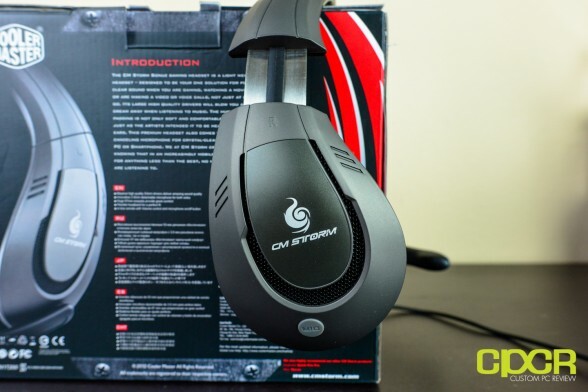 One such line of products under the CM Storm brand of course is the gaming headset, and it was only late last year when Cooler Master introduced their top of the line CM Storm Sirus, a true 5.1 gaming headset. 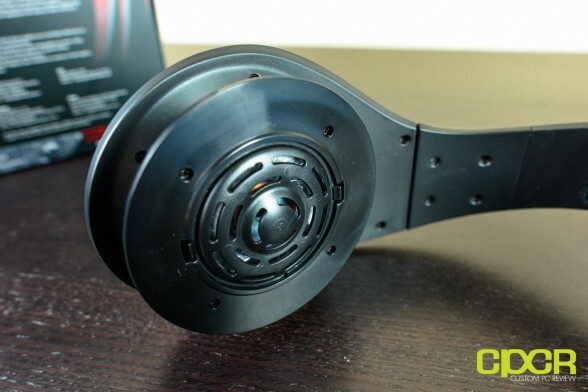 While the Sirus is definitely one of the better true 5.1 surround sound headset offerings on the market, it does still suffer from a couple limitations of this category of headsets – namely price, not-so-great music performance, and weight. After all, having three drivers and a subwoofer in each earcup doesn’t come cheap and will be heavy. 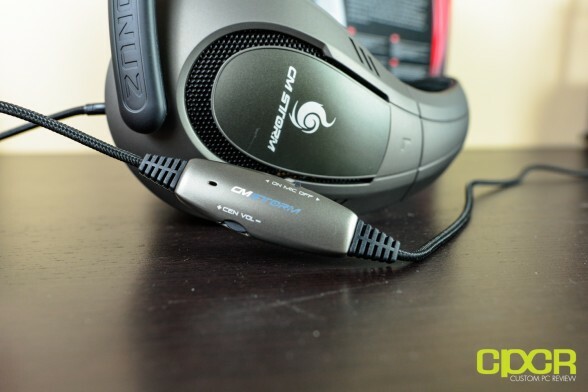 This is why when Cooler Master announced their first stereo headset, the CM Storm Sonuz, a couple months back, we were quite excited. 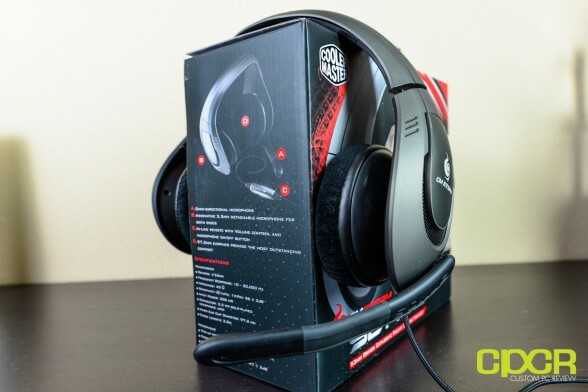 While the original launch was more of a paper launch than anything else, we did get a chance to try out the new headset at GESL 2012 this year and overall, we were definitely impressed with it. Armed with massive 53mm drivers, rock solid durability, and plushy cloth earcups, the headset definitely seemed like a winner. There isn’t much included with the Sonuz. Included is only a single piece of documentation detailing the features and how to get started. The first thing you will notice after taking the headset out of the box is how huge it is. The entire headset is constructed of some very heavy duty plastic. Each earcup has a very cool design with a CM Storm logo stamped right in the middle. As mentioned before, the plastic here is heavy and durable, giving the headset a very high quality feel. Right above the earcup, we can see that the headset has an adjustable headband that will allow for the headset to fit comfortably around your head. 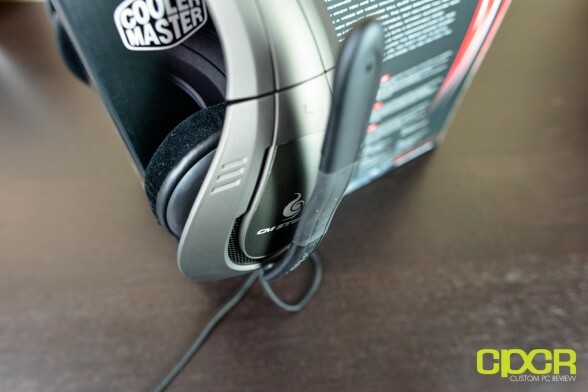 It’s of a metal construction as well, which fits the high durability theme created by the super durable plastic used for the rest of the headset. 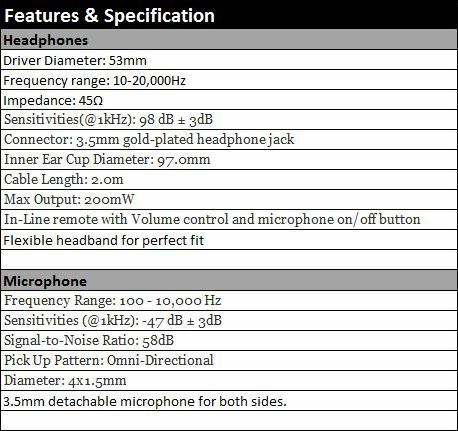 Also notice the small grey rubber piece labeled “mic” here as well. This piece can be removed allowing you to attach the mic to whichever side you prefer. The earpads are huge. No, really. They are 97mm in diameter and could easily accommodate even the largest ears. The earpads are also made from a nice cloth (microfiber type) material and are quite padded. This padding not only provides great comfort but also serves as a passive noise insulator. 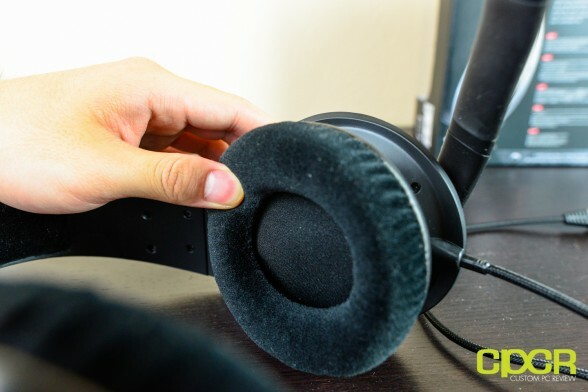 Like all other headsets out there, after prolonged use of the Sonuz your ears will get quite warm; however, with cloth earpads, your ears do get to breathe a bit which may make the difference between warm ears and disgustingly sweaty ears. Nice thing about this headset is that the earcups are removable, which suggests that replacements may be purchased (unconfirmed). Underneath the earcup is the huge 53mm drivers, which is larger in comparison to the 30mm, 40mm, and 50mm drivers we typically see in stereo headsets. 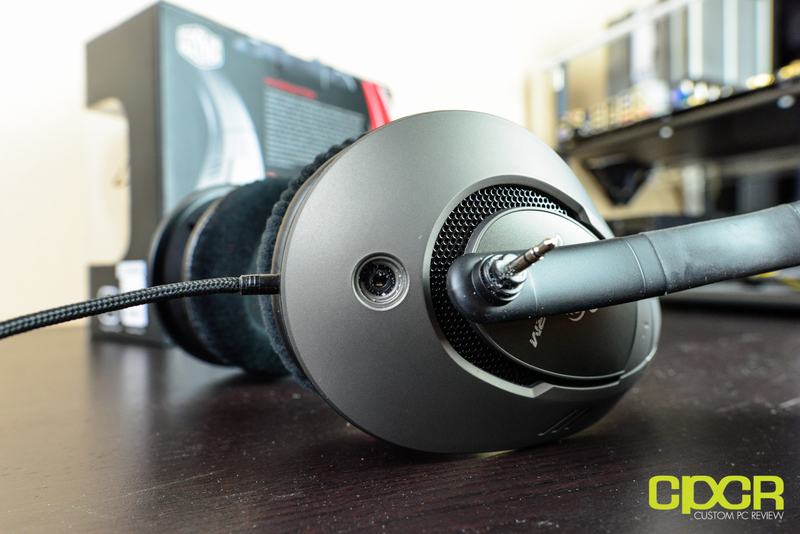 While typically driver size does suggest the quality of sound that may be achieved with the headset, it isn’t the be all end all as high quality 40mm drivers may sound much better than lower quality 50mm drivers. The padding on the headrest is also made out of the same material as those of the ear cups and provides padding for the head. This allows the Sonuz to maintain only three points of contact with your head – the top, the right ear and the left ear. What’s really nice is that each point of contact is padded as well. The headset also includes an in line control unit that will allow you to raise and lower the volume conveniently by turning the adjustment wheel. You will also be able to quickly mute/unmute the mic by flipping the switch from one direction to the other. The Sonuz comes with two 3.5mm gold-plated connectors for audio and microphone. 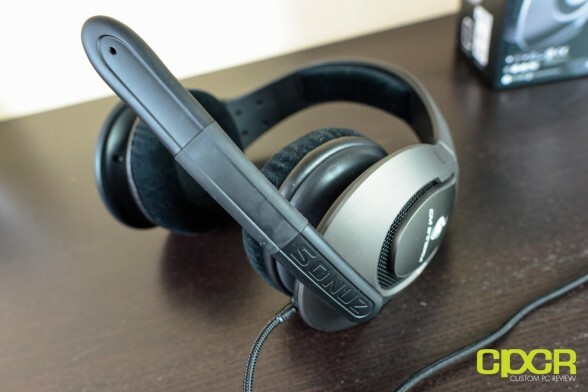 Unlike USB headsets out there in the market that use digital signals the Sonuz uses analogue signals and will benefit greatly from a good sound card. 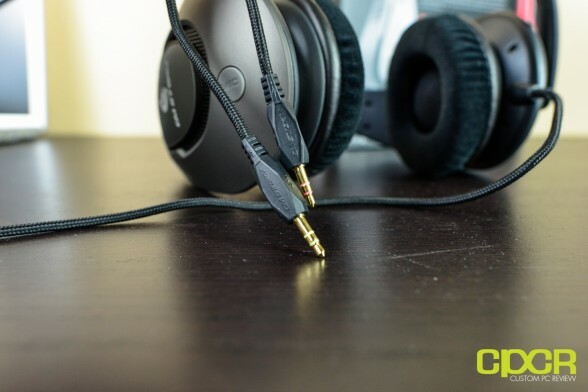 However the advantage of having a headset that supports the 3.5mm jack is that you can connect it to your mobile devices and have some awesome headphones on the go. The Sonuz is also compatible with any devices (such as cellphones) that have 3.5mm headphone and microphone jacks. Since the Sonuz is a gaming headset, my main focus in testing was in gaming. I first started my test by playing StarCraft II. While playing StarCraft II, all the environmental sounds were crystal clear as well as the background music. During battles you could hear the units without any distortion or static. With Left for Dead 2, again the headset performed flawlessly. I could hear the individual sounds of each zombie and as we all know being able to distinguish a smoker from a hunter from a boomer is essential for survival. Finally, in Battlefield 3, that’s where this headset really shines. The 53mm drivers really captures the experience quite well as tanks rolling by, low altitude planes flying by and explosions were heard with head rumbling awesomeness. Firing up a couple action flicks this time, I found that the Sonuz again performed quite wonderfully. Since the headset is a bit base heavy, I immediately watched some recent action blockbusters such as Fast Five and I was definitely impressed here as well. The rumbling of the engines sounded quite vivid and amazing and the action scenes sounded great as well with guns blazing and things… exploding. The enhanced bass from the huge drivers again was a welcome addition especially since I’m more of a action film guy. Explosions? Count me in! Music sounded reasonably good as well. As noted on the movie tests, the bass is quite intensive here so genres such as Dubstep and House music sounded quite good. Other music genres like rock and pop sounded OK after some tweaking on the equalizer settings. The bass is definitely a bit overpowering though – to the point where the bass is just sort of a rumble. The mids and highs were alright as well, but I’ve definitely heard better from other headsets. The microphone was tested by chatting through Skype and other VOIP calling programs. People on the other end of the call noted a significant improvement over my stock laptop microphones. The ability to remove the microphone and place it on the other earcup is a nice feature. Comfort was a bit of a mixed bag for me. On one end, the headset felt nice with the cushioned earpads and head rests. The headrest design and material choice allowed for airflow and therefore did not make my head too hot. The earpads fit my ears well and like all other headsets after extended use made my ears a bit warm, but not sweaty like they do with headsets with leatherette earcups. People with glasses shouldn’t have much of an issue with this headset as well as it is padded with a very soft material. That said, I did find the earcup padding a bit too shallow which caused the tips of my ears to touch the material on the inside of the earcup. This caused my ears to get a bit itchy after a while, which made the headset quite uncomfortable. The heavy weight of the headset certainly didn’t help either. After hearing about the Sonuz a couple months ago, checking it out for the first time at GESL and finally getting a chance to test the headset for the past couple weeks, I’d have to say Cooler Master has done quite a fantastic job with their first stereo headset offering. In terms of performance, the Sonuz is definitely a great headset for those who plan to do a lot of gaming or watching a lot of movies. Audio perfomrance is decent as well, especially for those who really enjoy having a ton of bass rumbling around. 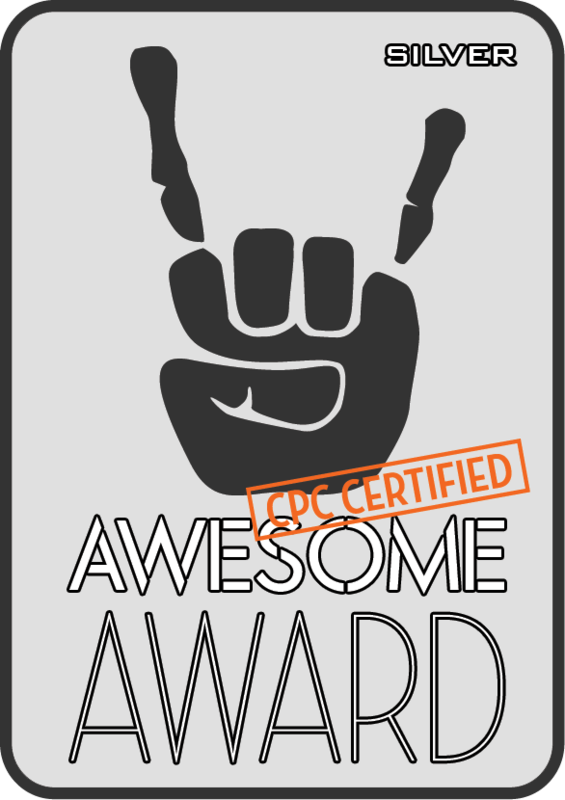 Personally, I’m not too fond of such overpowering bass, but a couple equalizer adjustments later, I was good to go. I’d definitely like to see Cooler Master tune a little less bass into their next headset though. Seems like the champion of bass heavy headsets, Creative, has officially been dethroned in the bass department. That’s for sure. Appearance wise, I’d have to say that the Sonuz isn’t going to be the best looking headset at your next LAN party – especially with some of beautifully designed stuff from the likes of Razer, Corsair, and SteelSeries. Weight wise, the Sonuz isn’t really going to win any awards either. 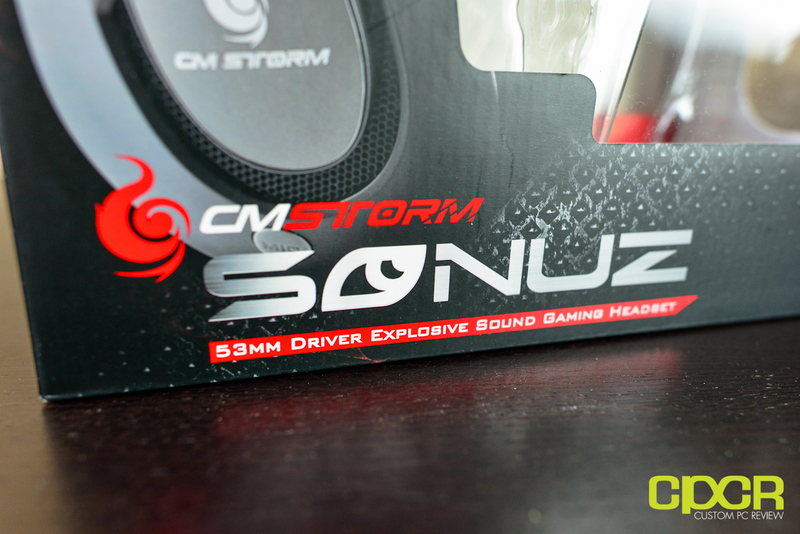 Aside from the Sirus, the Sonuz is probably one of the heaviest headsets I’ve ever used. That said, what you are doing is making a huge tradeoff here for both comfort and durability. In the comfort department, Cooler Master has really done a good job by going with a microfiber type material, which will allow air to flow around the top of your head and your ears. They’ll get warm after some intense gameplay, but not hot and sweaty. The 97mm earcups and the adjustable headband will definitley fit any sized head without issues, but be warned if you have large ears as they might touch the inside of the earcup, causing some discomfort after extended usage. 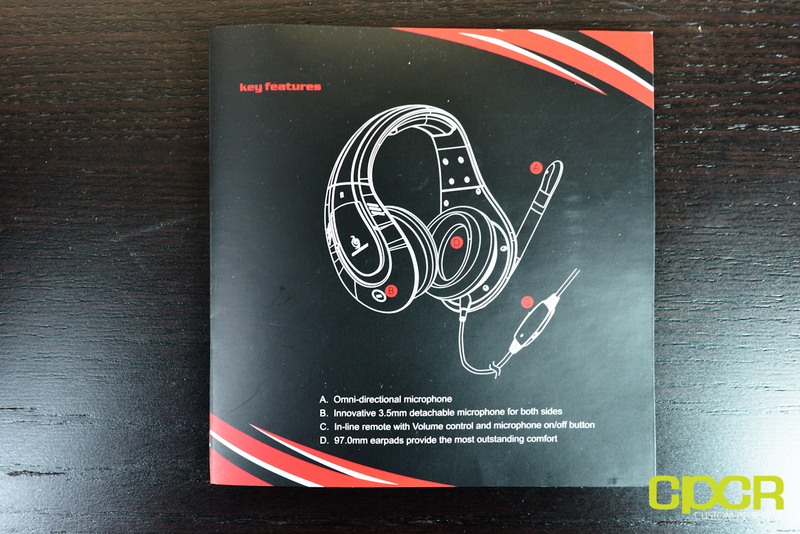 Also, the headset is going to be a bit heavy so those sensitive to heavier headsets may want to stay away from this one. 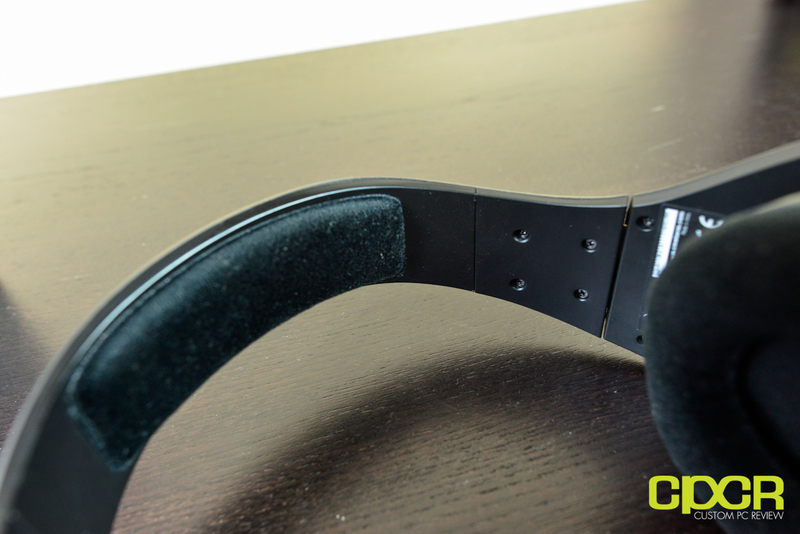 As far as durability is concerned, this headset is seriously a tank. I’d actually be surprised if you broke this one under normal use. With a price of $69.99 on Newegg, I think the CM Storm Sonuz is definitely quite competitive with other headsets in the sub $100 range. Competitors include the Creative Tactic 3D Sigma, Corsair Vengeance 1300, Razer Charcharias, SteelSeries Siberia V2, and the Plantronics GameCom 780. Of those, only the Razer Charcharias and Plantronics GameCom 780 feature cloth earpads, and only the Creative Tactic 3D Sigma, Corsair Vengeance 1300 and SteelSeries Siberia V2 feature 50mm drivers. Whereas the Sirus is more of a niche product designed for gamers with already a high quality pair of headphones looking to get some true 5.1 surround sound, the Sonuz is more of a product designed for the general gaming audience providing a great balance of gaming,movie and music performance. Those who enjoy tons and tons of bass, be sure to take a good hard look at this one. There isn’t a single headset on the market under $100 that will provide you as much bass as what the Sonuz will. The Cooler Master CM Storm Sonuz is currently available on Newegg.